In Peloton there are three big tours and a lot of small tours. The three big tours consist out of 11 races. These races may vary each season. A small tour normally consists out of 3 races, but it can also be 4 or 5. You can take part in a tour by adding your cyclists in your teams tactics for the first race of that tour. You will find those team tactics in the calendar. For every participating cyclist you'll have to pay 500$ participation fee, which is lower than the fee for single races. During the race there are intermediate sprints for green and mountain jersey. At the finish all cyclists can gain points for the green jersey and bonifications seconds. The winner of a race gets 10 seconds of bonification, the 2nd one 5 seconds and the 3th cyclists will gather 3 bonification second. Peloton will automatically assume that the cyclists selected for the jersey struggle are the same for every race during that tour. Though you are able to select another cyclist for the next race(s) in that tour. For a closer look on how the race results are calculated, click 'Races' in the menu on your left. Prize money is handed out after every race and when the tour is finished. 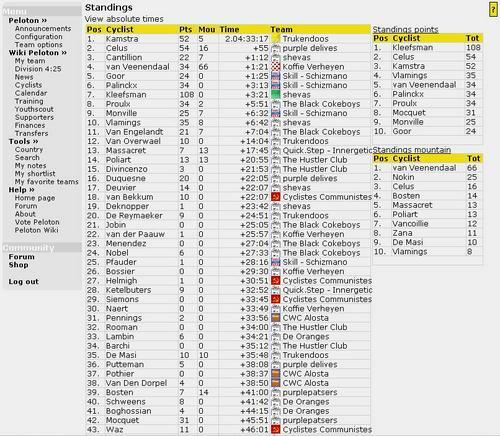 NOTE: In tour races there's a maximum of 50.000$ victory bonus awarded. However, you won't always win the full amount because it is dependent on the number of participating teams.